Motorists say the stupidest things. Well, some of them do, and so do their passengers. Who could ever forget the Mancunian ‘no pay, no say’ conversation? But for sheer comedy gold it would be hard to beat this exchange, which happened in Brixton at the weekend. It’s remarkably polite, from both sides. And erudite from the cyclist. 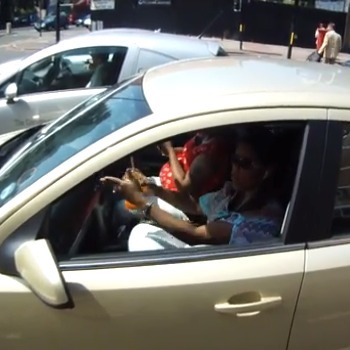 What the video confirms, with knobs on, is that there’s a genuine belief that the payment of ‘road tax’ gives cars priority over cyclists on the roads. The little perforated disc in the windscreen is believed, by some, to be a road usage fee and, as cyclists are perceived not to pay this fee, they’re deemed freeloaders and ought not to get in the way of the fee payers. In the following exchange – which also involves a punishment beep and a squeeze into a bus lane (it was a Sunday) – the car passenger seems incredulous that a cyclist could also be a motorist. Top marks to themitsky for keeping calm during the exchange, and bonus points for explaining, between traffic lights, the intricacies of the emissions-based vehicle exise duty and why cyclists sometimes ride in the middle of the road. One more set of traffic lights and themitsky may have been able to explain who and what actually pays for roads. Passenger: “Good for you, put it on youtube”. This entry was posted on Monday, July 8th, 2013 at 11:58 pm	and is filed under No such thing as road tax!. You can follow any responses to this entry through the RSS 2.0 feed.